Eurostar had 2% more passengers travelling between the UK and Europe in 2012 than in 2011. It has 9.9 million passengers in 2012, compared with 9.7 million in 2011, and there was 8% growth in travellers from outside EU. Eurostar’s sales revenue was 799 million in 2012 (2011: £803 million) with an operating profit of £52.3 million in 2012, up from £25 million in 2011. The combination of the Olympic Games and the Jubilee caused an increase in the number of travellers coming to London, by Eurostar. Eurostar has 28 trains, which can each carry some 750 passengers. There will be some fleet refurbishment, and some new trains by 2015. By contrast, there were about 115.5 million air passengers who travelled between UK airports and EU airports in 2012, and some 114.5 million in 2011. ie. about 8% of passengers travelling between the UK and Europe went by Eurostar in 2012. Promotional campaigns helped Eurostar to maintain revenues during the first three months of this year. The high speed rail service between the UK and mainland Europe reported a 1% rise in revenues, up to £213m from £211m in the same period last year. Business travel struggled due to lingering economic uncertainty throughout Europe, the company said. But promotions such as one offering 150,000 seats from £59 meant leisure bookings soared. During the 13-day period in which the promotion ran, bookings exceeded the record set during the ash cloud disruption in 2010. Marketing campaigns abroad also led to increased sales revenues and passenger numbers for travellers originating outside the EU. Nevertheless, overall passenger numbers dipped slightly compared with last year. Eurostar said 2.23 million people used the service between January and March this year, compared with 2.24 million a year earlier. The weather this year posed a significant challenge to the company. Eurostar services were suspended in March after severe snowstorms across north-western Europe. “This is an encouraging start to the year in spite of the challenges posed by both the economy and the weather,” said Nicolas Petrovic, chief executive of Eurostar. “Our sales revenues have grown during a quarter which saw heavy snowfalls and some of the coldest temperatures on record in the south of England and northern France”. 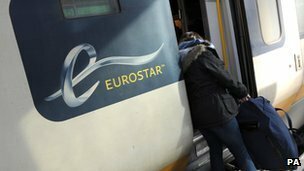 Eurostar, the high-speed passenger rail service between the UK and mainland Europe, today reported a strong performance in 2012 marked by rising passenger numbers and good growth in profitability. Despite the difficult economic backdrop, passenger numbers for the year ended 31 December 2012 rose 2% from 9.7 million to 9.9 million. Whilst business travel remained flat, the uplift in passengers was underpinned by continuing resilience in the leisure travel market as the number of leisure passengers grew by 3% compared to the previous year. The number of international travellers originating outside the EU has shown particularly strong growth during 2012, with volumes up 8% year-on-year. Responding to the difficult European economic environment, Eurostar has invested heavily in its international marketing capitalising on London’s year in the spotlight with the Jubilee celebrations and a summer of sporting action. In 2011 Eurostar delivered its first profit in its first full year of operation as a standalone company. Continuing this momentum, the business today reports an operating profit of £52.3 million in 2012, up from £25.0 million in 2011. This growth in profitability is driven by an increase in the volume of passengers combined with strong cost management across the business*. Sales revenues in 2012 were broadly flat year-on-year at £799 million versus £803 million in 2011. The sales revenues were, however, heavily impacted by the movements in exchange rates over the year. At constant (€1.15) exchange rates, sales revenues increased by 5%. Eurostar continues to innovate and enhance its service and the investments it is making over the next two years will shape the business for future growth. The £700 million investment in creating a new fleet of trains remains on track with the production of Eurostar’s new e320 trainsets and the refurbishment of its existing fleet progressing well. Both the refurbished and new train sets are being delivered to a design created by Pininfarina, the world-famous Italian design house and the business looks forward to presenting its customers with a completely new fleet by 2015. 2013 also marks the launch of new services. Ski enthusiasts will benefit this year from a new partnership with international high-speed train operator TGV Lyria offering a weekly service between London and some of Switzerland’s most popular ski resorts, while later this summer, new direct services to Lyon and Provence will launch for a trial period. Passenger volumes reflect the number of travellers carried by Eurostar in the period. * The net profit for 2012 was £91.0 million compared with £20.8 million in 2011, principally reflecting the increase in operating profit referred to above as well as a non-trading item in the year. As a sponsor of the London 2012 Games, Eurostar played a key role bringing hundreds of thousands of fans and athletes to the Games. In addition to transporting the French, Belgian and Dutch Olympic teams, Eurostar carried out extensive modifications to its trains in order to transport the French and Belgian Paralympic teams to and from London. The current Eurostar train was first introduced into service in 1994 carrying 750 passengers and operating at speeds of up to 300kph. Since then, the fleet of 28 trains has carried more than 130 million passengers between London and the Continent. Following their refurbishment these trains will continue to form a core part of the Eurostar fleet. British Airways would like to work with Eurostar to combine flight and rail services on the same ticket. BA’s commercial director Drew Crawley said the carrier had been looking at “opportunities to work with trains”. “We would like to interline with Eurostar to offer a Paris-London sector on the train,” said Crawley at the ITM conference in Windsor. “We would like to be able to price them, but so far trying to do this has been a big struggle – even though Eurostar wants to do it. Technology is the critical issue. Eurostar currently accounts for 70 per cent of the market between London and Paris, although BA still operates 11 daily services on the route. Lufthansa’s UK general manager Christian Schindler said that there were many technical issues in combining flights and trains within the same journey including different levels of security. “Railway systems do not have the same security measures in place – there’s no check-in, you just board the train,” he said. Posted: Thursday, April 18th, 2013. Filed in General News, Recent News.